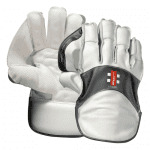 Helping you stump the batsman, check out our great range of cricket wicket keeping gloves. No matter how fast the throw comes in, you’ll be onto it as fast as Gilly with our Cricket Wicket Keeping Gloves! Wicket keepers will also be bowled over by our large range of wicket keeping inners and wicket keeping pads too. So why not save yourself some money by ordering your cricket wicket keeping gloves online? That way you’ll have some cash for the post-game celebrations! All orders received before midday are shipped the same day, and if you can’t find what you’re looking for, give us a call on 02 4969 3263 or fill out the email form.